concerns should be studied and simplified as much as possible. A safe, streamlined process for analysis that is understood by all is required to ensure the risk of catastrophic failure is minimized. should likewise engage with the architect to ensure roof slopes will properly collect water at the primary drains. In the case of a primary drain backup, the overflow design handles water without ponding. 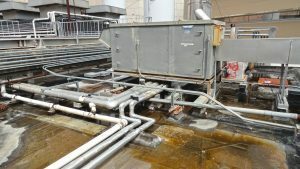 Finally, coordination with the plumbing contractor is necessary to ensure the roof drain size and height will be set properly, and the conductors are designed and installed to be fully independent from primary drains to superintend rain to the overflow as required. 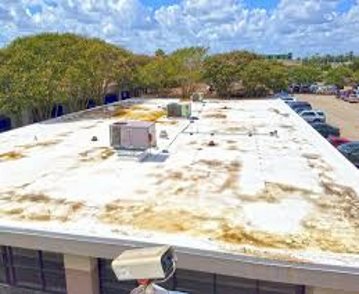 The most important factor in preventing ponding on the roof is providing adequate slope to quickly and efficiently get water to the primary and overflow drainage. The newer building codes require one-quarter inch per foot of slope and define those areas without adequate slope as “susceptible bays”. Susceptible bays include areas where water is impounded – when the secondary drainage system is functional while the primary drainage system is blocked. Progressive deflection or instability are worst-case scenarios preventable with adequate drainage. 2. if there is adequate stiffness, equilibrium will occur, and the deflection fails to increase and ponding maintains a constant depth while draining, which protects against progressive deflection and instability. orientation isn’t typically considered when designing roof slope and drainage, but if the engineer takes responsibility for coordinating with architects, it is more likely to be incorporated into the design. When designing for secondary (emergency) drainage, otherwise known as overflow drainage, typically the geometry and design of the primary drainage system drive the overflow design. If cost is a consideration, scuppers are preferred versus overflow drains due to an increase in plumbing costs to discharge the overflow to an endpoint separate from the primary system. Section 1108 of the International Plumbing Code (IPC) also requires all overflow to be discharged to a location above grade that would be observed by building occupants or maintenance personnel. This is to alert all parties the primary system has backed up or become clogged, and the overflow drain now has to manage the water. With larger areas and bigger drains, it is a common mistake to create a sump for both drains with a hydraulic head that ends up being higher than the overflow collar. 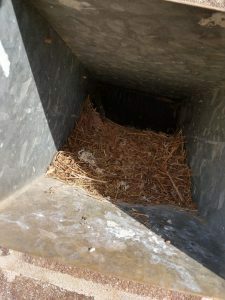 This arrangement can cause the overflow to activate during regular rain events without the primary drains being backed up creating staining on the walls. This also defeats the purpose of the visible discharge for the secondary drainage system because it’s now unclear if it’s activated due to the sump design or a primary system backup. or have inadequate overflow capacity due to code requirements and guidance at the time being unclear. clogging or backing up, or having inadequate overflow drainage.